Knighthood certainly seems to be an institution whose time has passed. The days of feudalism, liege-lords, fortified castles, and crusades may indeed be over. However, the Christian knight’s renowned commitment of service to others and his spirit of chivalry endure to inspire us even today. In fact, in a day of intense materialism, the willingness of groups of committed Christians to place themselves at the service and the defense of the weak and vulnerable has perhaps never been more awe-inspiring and more needed. The institution of Knighthood arose in Christian Europe. 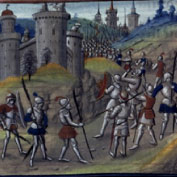 It origins can be seen in the “Truce of God” in the early Middle Ages as the Church attempted to restrict the fury of feudal warfare by forbidding fighting on certain days, such as Sunday and major feast days, and in certain places, such as churches and monasteries, and by protecting certain persons from attack such as clergy, monks and women. The clergy took advantages of such truces to extract from feudal warriors a vow to use the sword principally for the purpose of defending the weak and defenseless, women and orphans and the Church itself. The Church extended its tempering influence even more when it called upon the warrior class to use their arms to regain the holy sites in Palestine from Muslim occupation and to protect the pilgrims who journeyed there. The great goal of knights and pilgrims was the reclaiming of the Holy Sepulchre in Jersulaem, the site of the crucifixion, burial and resurrection of Jesus, considered by Christians to be the holiest site in Palestine. 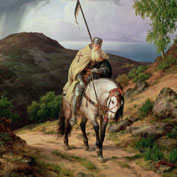 Pope Urban called for the initial Crusade in 1095 which eventually led to the establishment of the Christian Kingdom of Jerusalem and the need for a new institution in the Church, religious orders of knights to defend the Christian sites. Thus arose the Teutonic Knights, the Sovereign Military and Hospitaller Order of St. John of Jerusalm, of Rhodes and of Malta, the Knights Templar, and the Equestrian Order of the Holy Sepulchre of Jerusalem. These warrior monks took religious vows with the particular goal of defending the holy land from the Saracens and other Muslims and protecting and sheltering the many Christian pilgrims who flocked there. A code of good conduct developed for these Knights which came to be known as chivalry, derived from the French cheval, or horse, referring to the fact that these warriors were mounted on horseback. The chief chivalrous virtues were piety, honor, courage, chastity, courtesy, and loyalty. The expression noblesse oblige (“nobility obliges”) captures the sentiment that the chivalrous knight does not impose himself upon others but is rather obliged to place himself at their service, particularly the weak, the poor and the sick. The ideal of the Knight continues to capture the imagination of many even in our own day. When a Catholic fraternal benefits society was founded in the late nineteenth century in Hartford, Connecticut it was the ideal of the Knight with his allegiance to Church and country and to the poor and needy, the figure of the knight chosen to define the organization’s spirit: the Knights of Columbus. Their bonds of Catholic brotherhood at the service of the Church has enabled otherwise isolated and ineffectual men to become one of the most powerful, and effective philanthropic organizations in Christendom. Some Catholics consider themselves called the ancient orders which still exist. 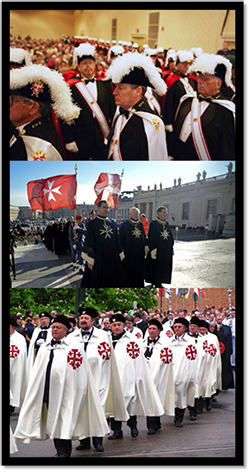 The Sovereign Military and Hospitaller Order of St. John of Jerusalem, of Rhodes and of Malta can date their service to their “lords the sick poor” and the defense of the faith to the time of the first crusade. Today it is one of the largest international relief agencies in the world. Likewise the Equestrian Order of the Holy Sepulchre of Jerusalem traces its roots back to the same period and Duke Godfrey of Bouillon. Its goal was securing the church which enshrines the place of the crucifixion, burial and resurrection of Jesus. The Order exists today to sustain and aid the Church and Catholic institutions in the Holy Land. The Palace of King Ludwig II of Bavaria on an island in the Bavarian Sea. It and the ancient monastery of Frauenwörth on a neighboring island can be reached only by ferry. The castle of Hohen Aschau in the general area where Pope Benedict grew up. The Castle/Fortress of the Prince Archbishop of Salzburg. Burghausen, the longest castle in Europe overlooking the Salzach River which is the border with Austria. That excursion will include a visit to Altötting, Pope Benedict’s favorite Marian shrine, known as the “Lourdes of Germany”. Neuschwanstein, King Ludwig’s Castle containing some of the most beautiful art in all of Germany. The Cathedral/Fortress in Freising, the original site of the Archdiocese of Munich. The Royal Palace of the Wittelsbach family in Munich. Participants will stay in a former Benedictine Monastery, Seeon, founded in 994. It became renowned for its illuminated texts. It was visited frequently by Wolfgang Amadeus Mozart. It was taken over by the state in 1803 and became a parish church. It became the residence for a period by the Dukes of Leuchtenberg of the Romanov family. It is currently a beautifully restored cultural center owned by the State of Bavaria. cent woodcarving and religious art. Its village chapels are some of the most beautiful in all of Europe with their painted walls and spectacular carved statuary. The faith of these mountain people is vibrant and colorful. Activities will include hiking mountain trails, gondola rides into St. Ulrich (Ortisei), one of the most fashionable shopping areas in the Alps, rides in horse-drawn wagons, and nightly formal four course gourmet dinners. The hotel features incomparable Alpine views, a swimming pool, sauna and steam room.